A bullet train leaving a station. The bullet train in motion compared to other rapid transit networks. A look at the bullet train download screen when the mod could be downloaded. 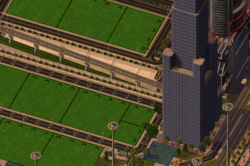 The Bullet Train Mod is a modification to the monorail created by APTX. Unlike the High Speed Rail project (HSRP), the bullet train mod completely replaces the monorail network, whereas HSR uses starter pieces to reskin the network. 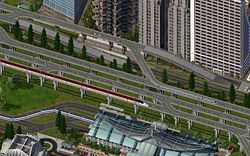 The bullet train mod has different speeds and capacities then the monorail or HSR, and comes included with a bullet train skin that replaces the look of the monorail network and the monorail car. 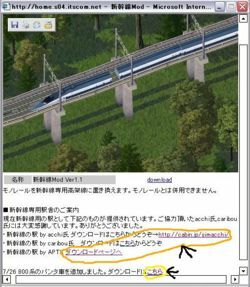 The Bullet Train Mod is downloadable from APTX's site, re-uploaded on November 2nd, 2008 from a perlonged crash on his main site back in early 2008. He has also re-released the one bullet train car skin texture on October 3rd, 2008 , and the other on October 18th, 2008 . 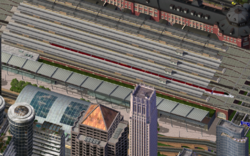 The Bullet Train Slope Mod. This page was last modified on 16 July 2009, at 08:34. This page has been accessed 17,917 times.